Before anyone ever sat down to adapt the 870-page Harry Potter and the Order of the Phoenix, the franchise already faced considerable challenges. Film franchises begin to tire once they reach their fifth installment. Many of the artists, writers, and designers who helped to tell a successful story in the beginning have started to check out, and creative endeavor splinters under the pressure to deliver another $100 million hit. 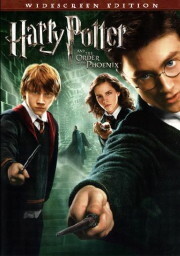 The immense popularity of the books, and some wise decisions on the part of Warner Bros., kept “the boy who lived” above water for four films. Steve Kloves, who adapted the first four films, had already proven an immense story could condense well onto film and still run under three hours. The Goblet of Fire, however, carried many visual elements that transitioned well to the screen. Phoenix – a darker, longer, and much more cerebral tale — does not. After witnessing the death of a student and the return of Lord Voldemort last year, Harry Potter (Daniel Radcliffe) ambles along the streets of Little Whinging to pass the summer days before he can return to school. Dementors interrupt his cousin Dudley’s (Harry Melling) cruel taunts, propelling the boy wizard into another cauldron of trouble. Soon he’s whisked into hiding by the Order of the Phoenix — the underground resistance formed by Headmaster Dumbledore in the first years that Voldemort terrorized the wizarding world — now reestablished to counter the looming threat of the Dark Lord’s return. Back at Hogwarts, Harry endures eerie visions in his sleep, and struggles against the accusations of lies alleged in the papers and shared by many of his friends. A new Defense Against the Dark Arts teacher (Imelda Staunton as the devious Professor Umbridge) only fortifies the Ministry of Magic’s suppression of Harry’s version of events, and refuses to instruct the students on how to defend themselves. In an effort to prepare themselves for the coming war, Ron and Hermione (Rupert Grint and Emma Watson) convince Harry to teach the students how to fight. With a new director at the helm (David Yates) and a writer needed to develop a script after Kloves’s departure, screenwriter Michael Goldenberg stepped in to handle the chores. Goldenberg, who had already proven his ability adapting Carl Sagan’s Contact in 1996, manages to capture the rage that hovers within Harry for much of the film. Certain elements from the novel had to go to keep the running time down (leaving those of us wishing for a rousing rendition of “Weasley is Our King” mildly disappointed), but Yates and Goldenberg keep the gargantuan plot moving and manageable. Much of the novel’s more visual elements make it into the film. The growth of Dumbledore’s Army, edited to taut precision by Mark Day, make up the finest moments of the film. Yet where film is more concerned with telling a visual story, many of the character elements that moved the fans of the novel never reach their fullest potential. Harry’s relationship to Sirius Black (Gary Oldman) receives enough attention to endear the greasy haired rebel somewhat to the audience, but it’s far from a homerun. The same goes for Harry’s relationship with Cho Chang (Katie Leung) and the development of Neville Longbottom (Matthew Lewis). Dumbledore, whose humble power roared in the novel, receives a terribly underwhelming treatment from veteran actor Michael Gambon. The dénouement in the headmaster’s office that so powerfully resonated in the book gets a scant minute and a half of screen time, feeling more like a highlight reel than an actual resolution. Imelda Staunton, however, captures the cringe-inducing Delores Umbridge to near perfection, reading Goldenberg’s lines as though they were scratched from the surface of a blackboard. Nicholas Hooper’s score rises in places to the level John Williams set on Prisoner of Azkaban, creating a subtle and charming theme for the oddly amiable Luna Lovegood, and sweeping the audience through Harry’s sessions with Dumbledore’s Army. Director Yates wisely keeps to the same design and atmosphere established by Alfonso Cuaron on Azkaban, and adds more handheld camera work to breathe frenetic energy into the film’s climactic action sequences. At its finish, however, the film feels stretched between creative trims and cuts to produce an entertaining movie, and the studio’s fiscal concerns to produce a film that can play enough times in a day to earn enough money. DVD special features include an electronic version of the film for your PC or portable video device (sorry, iPod users, the file won’t play with Apple’s iTunes software). Deleted scenes add little to the experience and fortify the editorial choices in the film, although Emma Thompson does get to show off her comedic genius in an extended cut of the opening feast. Following Tonks actress Natalia Tena around the movie set will score some chuckles (keep an eye out for the refrigerator — turns out Tonks has an affinity for Coca-Cola). Two other documentaries are included: “The Hidden Secrets of Harry Potter,” which makes for an entertaining recap for those only familiar with the movies, and director Yates and editor Day walk through the Dumbledore’s Army sequences. Phoenix would likely have played better had certain elements received their due attention, but that would mean a running time perched dangerously close to three hours. And Order of the Phoenix is not The Lord of the Rings. Last summer, Hollywood set out to create “The Summer of Threes,” with Shrek the Third billed as a solid contender. With two successful installments under his belt, the cranky ogre had the bar set pretty high by default this time out. So, in what the filmmakers may have deemed to be true to character … that bar was cast aside. The result is a light, chuckle-inducing 90-minute ride that recalls, though fails to reproduce, the big laughs its predecessors delivered. While King Harold the frog suffers illness, Shrek and Fiona (voiced by Mike Myers and Cameron Diaz) assume the day-to-day pageantry of the kingdom of Far Far Way. Just before his death, the king appoints Shrek successor to the throne, but names an heir – Arthur Pendragon (Justin Timberlake). Estranged from the swamp and reluctant to pursue royalty, Shrek sets out to find this wayward heir, but not before learning Fiona is – gulp – pregnant. Meanwhile, Prince Charming (Rupert Everett), still smarting from his clean defeat in the last film, strikes an alliance with a small assortment of fairy tale villains to overthrow the kingdom and lay claim to the crown. The setup earns its place in the Shrek canon of irreverent fairy tale antics. Arthur – or Artie, as he prefers – is a whiny, annoying little kid bullied by everyone at his school and far removed from the courageous legend his name evokes. Merlin appears as a displaced schoolteacher, more the mad magician than a fearsome wizard. The premise is near perfect. Yet, the result rarely generates more than the polite enthusiasm reserved for watching a quiet game of afternoon golf. A mere handful of jokes capture that mocking sense of satire and gleeful irreverence that propelled the first two Shrek movies to much-deserved success. Virtually gone are the pop-culture spoofs. The script seems content to rely on clichéd pratfalls and over-the-top villainy to execute its comedy, prodding its plot along the way. Writers should take note: resorting to the device of having characters switch identities is best left to world of Saturday morning cartoons. Directorial responsibilities this time fall to freshman director Chris Miller, who served as a story artist and additional writer for the previous movies. At the helm of this picture, he steers a clear, if uncreative, path. The touch of Andrew Adamson, director of the first two films, is noticeably absent – his duties helming The Lion, the Witch and the Wardrobe and the upcoming Prince Caspian forced him to take a step back to the producer’s chair. He does share a story credit, so the premise likely received his creative attention, but the film inevitably suffers without his more hands-on guidance. The DVD’s special features include a variety of kid-aimed extras, a computer gag reel, and a trio of deleted scenes, two of which showed some real promise. Their inclusion, and a more intentional exploitation of the satire afforded by the premise, might have elevated this film to the worthy succession of its namesake.